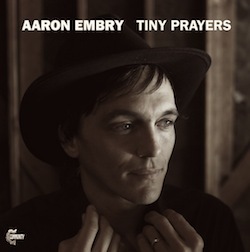 Aaron Embry waited thirty-six years to make his debut album, Tiny Prayers. It’s the type of record you only get a chance to make once — an album he began writing while on the road with his friend, Alexander Ebert. Before that, Embry was a hired gun for some other folks you may have heard of (Willie Nelson, Elliot Smith). Mostly a piano player, this particular set of songs came to Embry via an old tenor guitar, in an octave mandolin tuning, and a harmonica. “Moon of the Daylit Sky,” the album’s opening track and first single, is a rarified thing. Opening with just acoustic guitar and harmonica, like half the other folk songs before it, something immediately sets Embry’s apart. The arrangement is perfectly sparse, but there’s a bit of old-fashioned magic as some brushed drums, mandolin, and Embry’s tinkling of the ivory fill out the song’s skeletal frame. “Raven’s Song” shows off more of Embry’s graceful piano chops. He can be airy and vague on the keys but only in the way that a great jazz pianist can–not some hack banging out chords in the same positions. Other songs like “No Go” and “Good-Red-Road Man” are minor-key dirges, reminiscent of Appalachian murder ballads. His lyrics contain images that aren’t always clear–“My head all full of lies and smoke / An afterlife of stupid jokes,” he sings on “No Go”–but evocative. Thanks so much for the info. I look forward to checking out his songs. beautiful album. this will get some cold sunday night spins. Great music, thanks for making me discover him! I loved the mood in this song.